SEMCOR has been providing industrial quality products such as fabricated butterfly valves since 1907. We are a leading butterfly valve supplier in the Midwest because we work with manufacturers that have a proven history for reliability, long service life and diminished operational costs in their manual and automatic butterfly valves. Custom fabricated butterfly valves are also available from SEMCOR, with a variety of materials and designs to fit your unique circumstances. Ask us about your options for industrial butterfly valves and more. 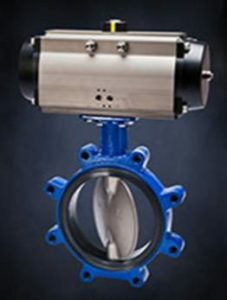 Industrial butterfly valves are a preferred method for controlling the flow of material through piping, whether that’s air, gas, steam, liquids or slurries. Some dry materials may also pass through industrial butterfly valves. We supply both metal and lined buttefly valves. 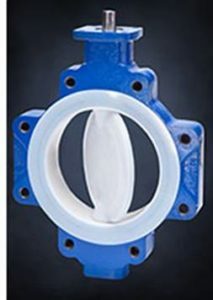 Today’s butterfly valves come in both automatic and manual options and can be found in industrial facilities ranging from cement manufacturing and gas processing to off-shore applications with extremely demanding applications. Some custom fabrication butterfly valves that SEMCOR supports include double- and triple-offset butterfly valves. As a butterfly valve supplier for generations, SEMCOR has seen requests for many unique options. We can help you select the best valve for your application. Browse manual and automatic butterfly valve options from SEMCOR on our valve product page. Explore the many great options and find what suits your need, then contact us for full pricing and availability. We’ll also work to ensure that your chosen product meets all of your industrial needs.